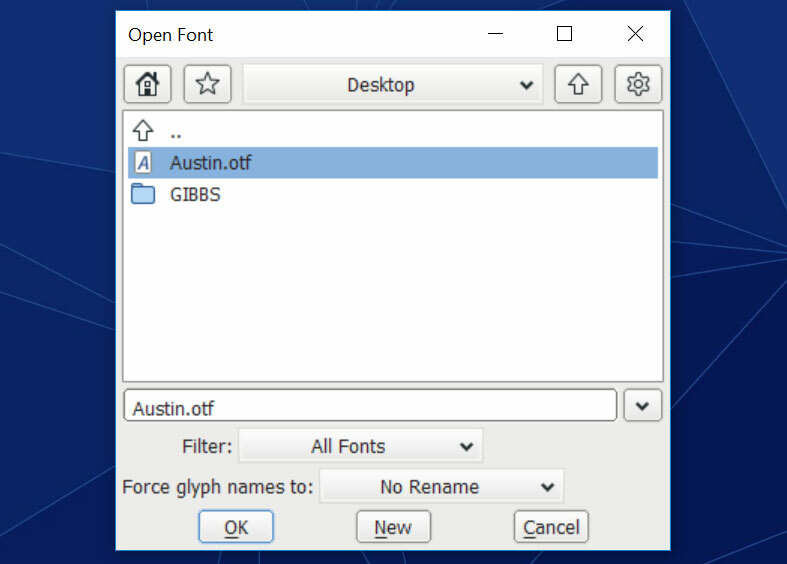 – What do I do if I get a new font, but I already have a font installed with the same name? – Is there a way to rename my fonts so I can keep track of which ones have commercial licenses? This tutorial is going to show you how to change the name of a font inside its code, so that it displays with that new name in your font picker, which can solve both of these questions! To start off, a bit of legal talk: please make sure that your license allows you to make changes like this to the font file. These changed versions should just be for your own personal use, which many licenses allow — look for a section of the license that talks about modifying font software. But you can’t change the name of a font and redistribute it under that new name. I’ll also point out here: most good marketplaces that offer their own in-house customer service will adjust font names for you! They can change “Austin” to “Austin Two” if you need it; when we sell fonts with a marketplace, we generally give them permission to make small changes as needed to get things working for the customer, with the understanding that any adjusted version they make is still owned by the font designer. Your first step is going to be downloading FontForge, which is a free font creation program. 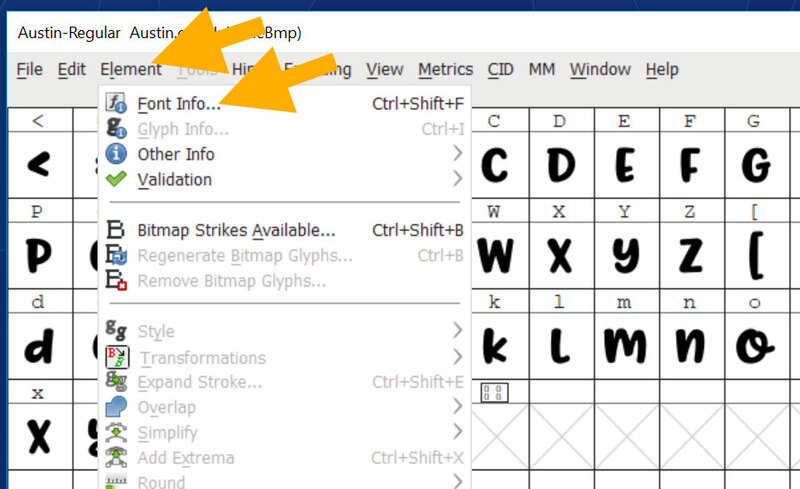 This is the program I used for an article on creating a font from scratch using all free software; it’s a bit more complicated than paid programs, but if you’re interested in learning, you can create your own font with it! 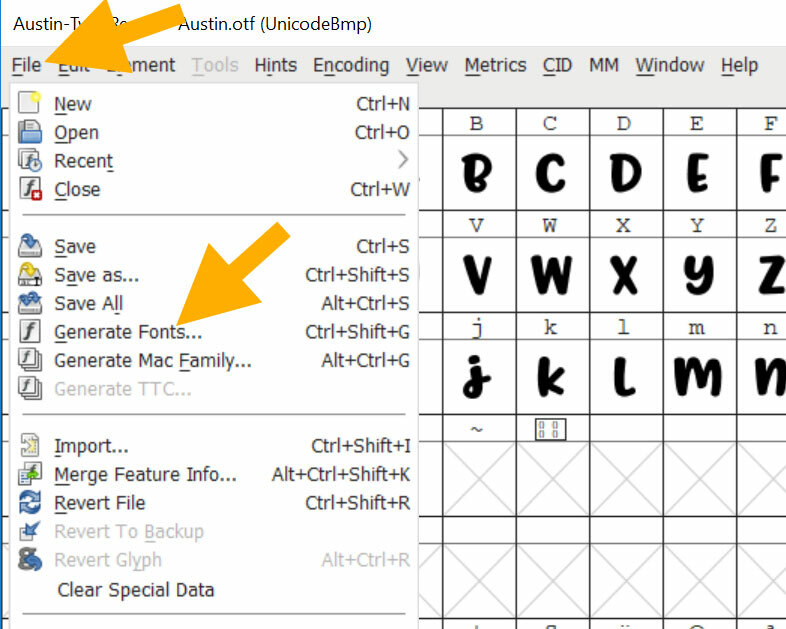 Once you have FontForge downloaded and installed, you’ll want to open it up. 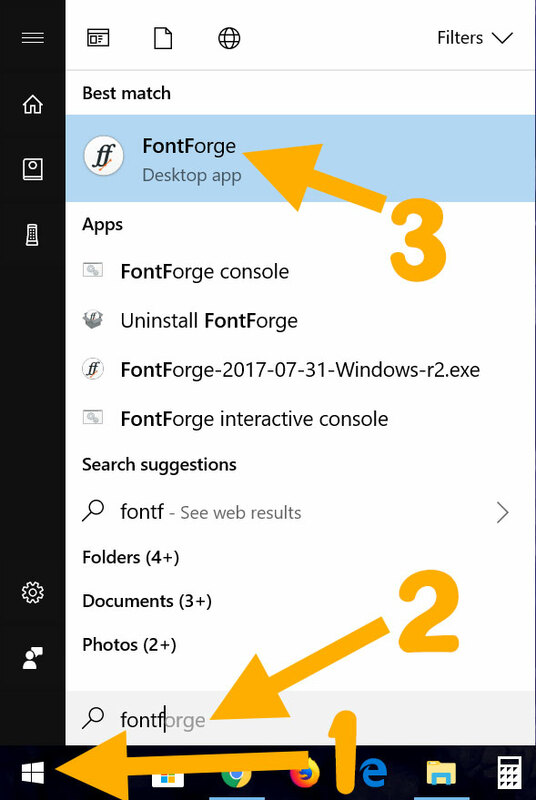 On my Windows 10 computer, that means opening up the Start menu (1), searching for the word “fontforge” (2), and clicking on the app when it comes up in the list (3). For my example font, I’ve renamed one of my own fonts so that it’s called “Austin.” Sorry to everyone with a font named “Austin,” but I’ve seen four different Austin fonts recently, so it’s definitely a font name where people may already have an Austin installed, and want to change the name of their new Austin so they can use both Austins. There may be just a few things in there, or there may be a lot. Don’t worry about them; you can close this panel down. The Font Information panel will pop up, with a huge list of over a dozen different options along the left side. The very top item, “PS Names,” will be highlighted in blue, which is great — it’s where we want to be. You should see the font name in three fields on the right-hand side. I’m going to change the name of this font from “Austin” to “Austin Two,” so I can have both it and the original Austin show up in my design programs. You’ll want to add the “Two” to the name in all three fields, but here’s the special catch: in the “Fontname” field, don’t put any spaces or dashes between the words. Let the titles of the name fields be your guide! “Fontname” is all one word, thus the font name should be AllOneWord. The other two fields, “Family Name” and “Name For Humans,” have spaces between the words, so you can do the same. As you can see, some of the elements in this grid have already changed to include the “Two” next to “Austin.” There’s just one spot, the “UniqueID” line, which needs to be adjusted. You can actually click in this field and type in it, so pop in there and do it! I’ve gone in here and added the “Two” to the name. In this field, use dashes between the words. There are four things to look at here. (And dang, those numbers I added are HUGE.) First, you can edit the file name (1) if you choose to. FontForge has suggested I call this file “Austin-Two-Regular.otf,” which is fine by me. 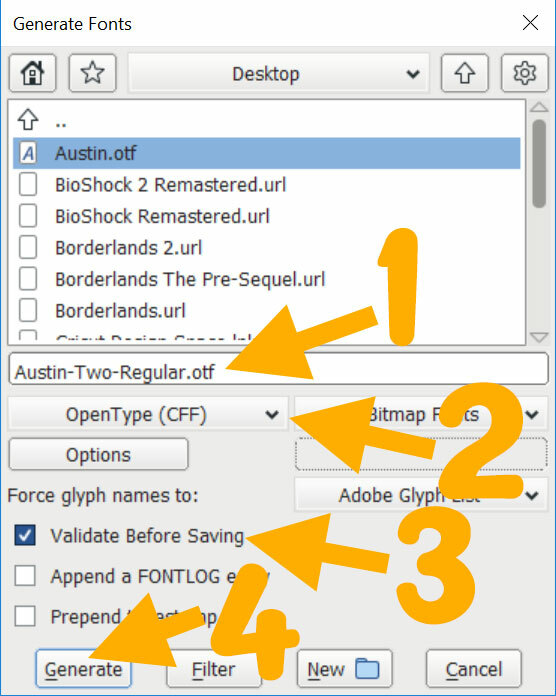 You can also choose which font file format you’d like to save in (2), with the default option being “OpenType (CFF).” Unless you need a TrueType font for a specific program, stick with this OpenType CFF option. There are a dozen other options in this drop-down you could choose, but many of them aren’t in common use. If you do need a TrueType font for one of those rare programs that will only use that format, choose the plain “TrueType” in this menu. You’ll see a box checked next to “Validate Before Saving” (3). You can uncheck this, but I’ll leave it checked so you can see in the next screenshot what happens. 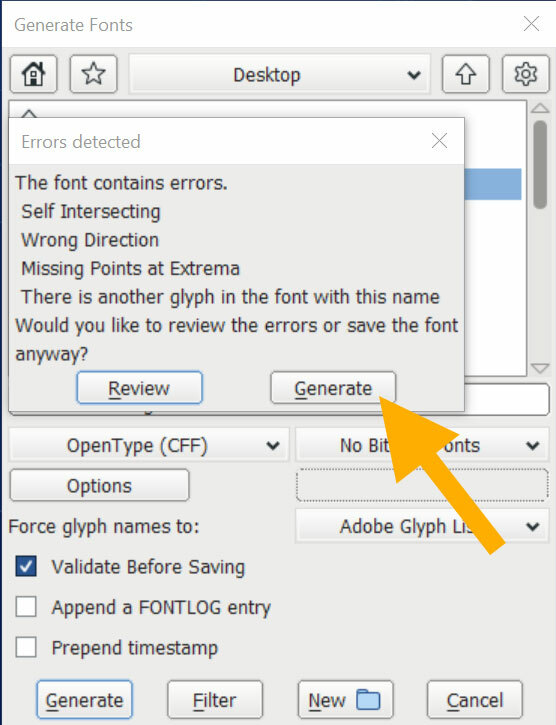 With all that dealt with, you can click the “Generate” button (4) to generate a font file. And here’s what happens when you leave the “Validate Before Saving” box checked. You get a panel that tells you that the font contains errors. and some of them may sound scary or intimidating, but they’re most likely not a big deal. I’ll go over the errors in this list, a couple of which I intentionally put in so they’d show up here, at the bottom of the post. We’re going to ignore the errors, and just click “Generate.” If you’d unchecked the “Validate Before Saving” Box, you’d bypass this pop-up panel. NOW, how about if you want to use renaming as an organization technique? 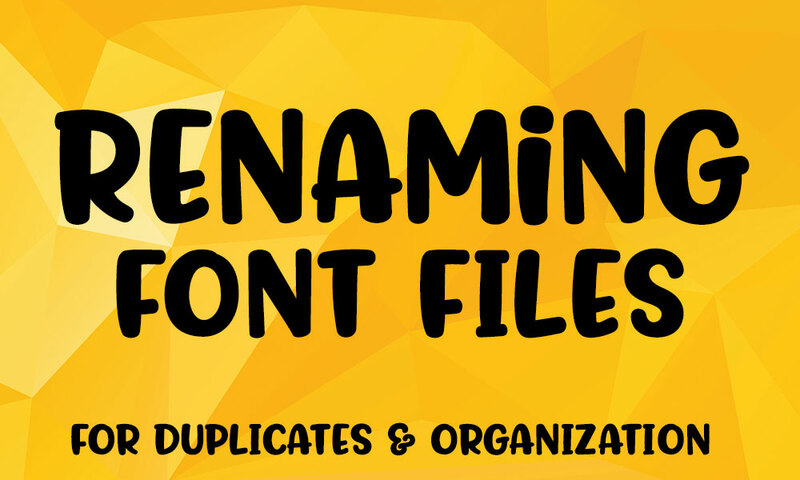 You can use a font manager for that, or if you only have a few fonts in one of those two categories, you can rename the files so that the name itself shows you. This way, when a program offers me a list of fonts in alphabetical order, this will shoot all the way to the bottom. You could, of course, also do “AAA Austin” to get it to pop up at the very top. Or something like “COMM Austin” if you want to note it as a commercial-use font, or “PER Austin” if it’s only licensed for personal use. But I like AAA or ZZZ, so they’ll be at one end or the other, instead of alphabetically in the middle. Don’t forget to stop in at the TTF Names and change that UniqueID field. Add in your ZZZ, or AAA, or whatever you choose, with hyphens between words. My ZZZ Austin font is showing up there at the very bottom of the list; if you know that your ZZZ fonts are the ones that have commercial licenses, you can zip right to the bottom of the list to see your choices for a client project. 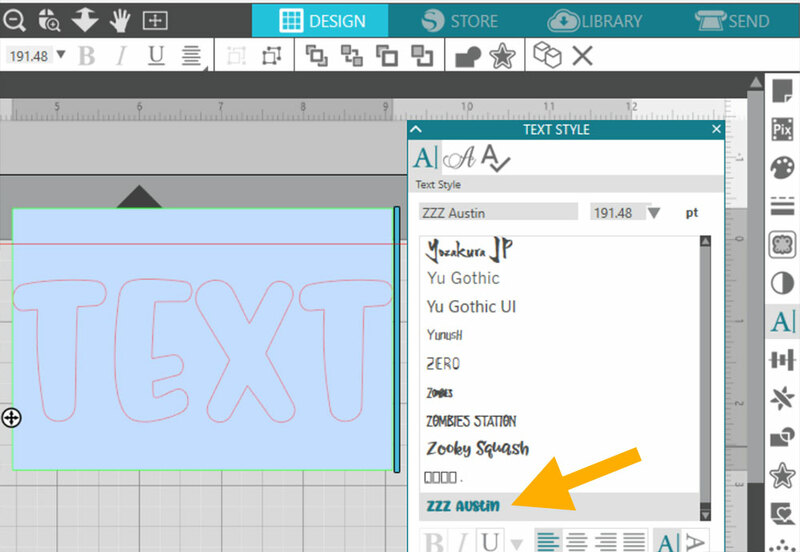 Or if you’ve marked your personal-use fonts with ZZZ, you know you can’t use those for customer work. Either way, you immediately know without having to dig through archives and file folders! So there you have it — using FontForge to make small changes to font names, in case of duplicate names or for organization. 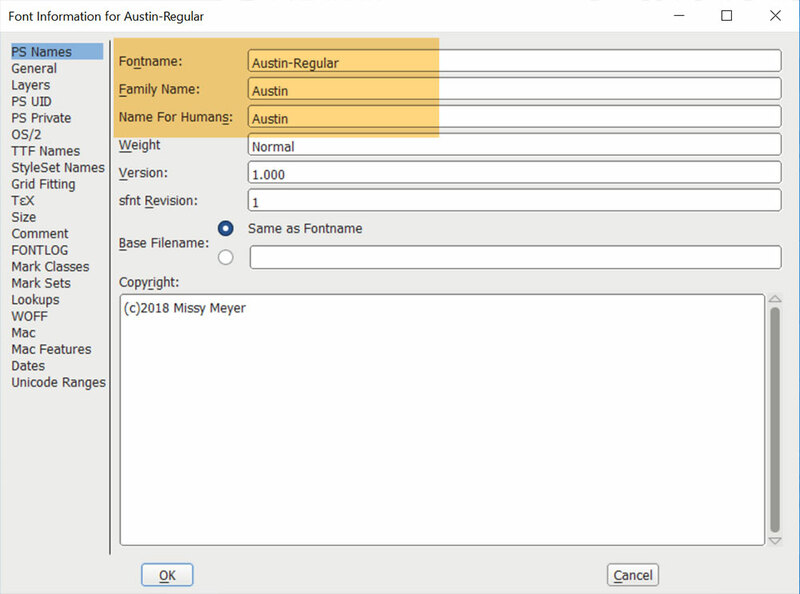 Remember, these renamed versions are for your use only, and be sure to check your license to make sure that it allows small modifications like renaming. Self Intersecting: You know how sometimes the outlines in a font cross over each other, and when you type out a letter there’s a weird empty spot in the letter that won’t weld away? That’s self intersecting. Wrong Direction: Picture if you will, drawing a circle on a piece of paper. You touched your pencil to the paper at one point, drew the circle in either a clockwise or counter-clockwise direction, then met up with your starting point. The letters of a font are drawn much the same way! Each outline in a font has a start point, and an end point, and the outline is drawn in either a clockwise or counter-clockwise direction. If a letter has a counter in it — the fully-enclosed second outline inside, like an an O or P or A, that second outline is drawn in the opposite direction, so your design program knows to subtract that shape out of the larger shape. Font designers want to make sure that all of their letters’ outside outlines go in the same direction. Otherwise, if you have two letters overlapping (like in a script font, where the tail of one letter goes over the next), if one is clockwise and the other is counter-clockwise, there will be a blank area where they overlap. Missing Points at Extrema: The extrema are the points on curves that are the farthest to the left, right, top, and bottom. Many font creation programs prefer to have a point (aka a node) at every extrema point. Many font designers don’t put points there, if it hinders the design of the character. The characters will work perfectly well without points at the extrema; including them just makes things a little tidier. There is another glyph in the font with this name: Usually when this pops up in FontForge, it’s referring to the quotation marks and apostrophes. Fonts can have straight up-and-down quote marks, and also the curved ones sometimes called “smart quotes.” And then there are also the “acute” accent mark, and the “grave” accent mark, which kind of look like tilted quotation marks. FontForge, for some reason, has a hard time telling them apart. But as long as they’re assigned to the correct unicode numbers (which they should be), it isn’t a big worry. 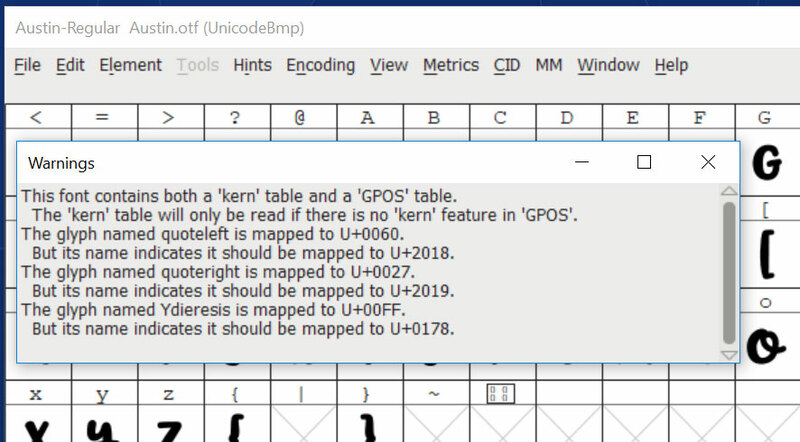 The font should generate fine, and the quote marks should work correctly in your renamed font even if you get this error.